Influential American investor, businessman, entrepreneur as well as philanthropist, George Soros was born on 12 August 1930, in Budapest Hungary, and is widely known as the chairman of the private firm “Soros Fund Management”, which deals with investment management. The company is also one of the primary advisors for the “Quantum Group of Funds”, a hedge fund located in the Cayman Islands and Curacao. So just how rich is George Soros, as of early 2017? According to authoritative sources, Soros’ net worth is estimated to be over $26 billion, accumulated through his many business ventures during a career which now spans over six decades. Soros managed to leave Hungary in 1947, and moved to London to study at the London School of Economics. In addition to his studies, Soros had to work as a waiter and porter, and later in a merchant bank to support himself and pay academic fees. Soros finally graduated from the LSE with a Doctor of Philosophy degree in philosophy, then ventured into a business career. Soros relocated to New York City shortly after finishing his studies, and began working at the investment company “Wertheim & Co.”, and later became a vice-president at the New York investment bank “Arnhold and S. Bleichroeder”. While still working at the company, George established his own company entitled “Soros Fund Management” in 1969, where he took up the position of chairman, and over the years has made it into one of the most profitable companies among hedge funds. It is estimated that since 1973, Soros’ firm has managed to accumulate as much as $32 billion in profits, and own $28 billion in assets that are under its management. Even though George Soros is best known as a business magnate, he is also a talented writer who has published such books as “The Tragedy of the European Union: Disintegration or Revival?” and “The Alchemy of Finance”, plus contributing such articles as “The Crisis and the Euro” and “The Capitalist Threat” to various newspapers. In his personal life, George Soros has married three times, firstly to Annaliese Witschak from 1960 to 1983 with whom he has three children. From 1983 until 2005 he was married to Susan Weber and they have two children, and since 2013 he has been married to Tamiko Bolton. His residence is in Bedford Hills, New York City. 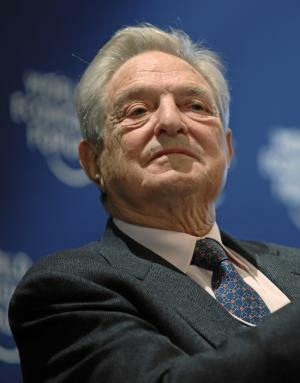 George Soros is a generous philanthropist, particularly through “The Giving Pledge’ with many other billionaires, and independently in supporting many varied causes around the world. George also founded a network called “Open Society Institute” in 1993, as a way of supporting Soros foundations abroad, and on which he serves as chairman. The company changed its name to “Open Society Foundations” in 2010, and primarily focuses on the promotion of human rights, economic and social reform, as well as supporting independent media, education, and fighting corruption. The company was later joined by Christopher Stone, who serves as the president. Some of the initiatives taken up by the “Open Society Foundation” include Public Health Program, Scholarships Program, Early Childhood Program and the Youth Initiative to name a few.